It is bio-renewable and safe for organic gardening, makes nutrients available to the root zone, allows faster seed germination, and helps growers use less fertilizer, water less, and reduces drought stress. Once mixed, apply horticultural formula to soil prior to planting seeds or seedlings, thoroughly wetting the soil, or apply around the roots of existing plants, bushes or trees, thoroughly wetting the soil. Easy-to-use, all natural soil amendment to promote plant growth indoors and out. reduces greenhouse gas emissions, conserves water). Some parts of the world suffers from drought annually. The lack of precipitation can slow the growth of crops that are essential to maintain adequate food supply. With SOIL SENTINEL, crops and vegetation can grow in water-stressed areas. This all-natural, cost-effective solution can increase crop production and decrease operating costs. Growers are able to produce more within the same area without cultivating additional land resulting in high returns. Below and to the right are examples of Soil Sentinel's successes. 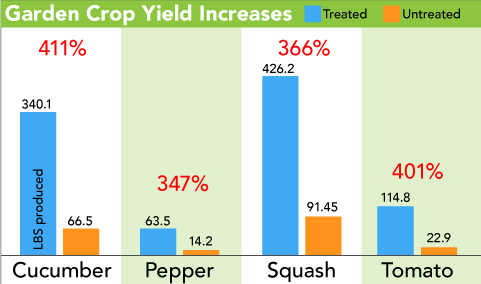 The above chart shows yield from untreated vs treated crops under the same environmental conditions. Total rainfall during growth period was 12.1 inches-- near drought conditions. No pesticide or fertilizer was used. Our biodegradable soil amendment is easy to use, easy to store, is non-toxic and non-flammable. SOIL SENTINEL is certified as a Biopreferred product by the USDA and is acceptable for use in organic production. The product is currently being reviewed by the Organic Materials Research Institute (OMRI). In the garden: At start of growing season, apply 1 Qt of Pour 'n Grow per 30 sq ft of garden, mix into first 3" of topsoil. For houseplants: Apply at base of plant, thoroughly wetting soil. As a guide, apply 1 ounce of Pour 'n Grow per inch of diameter of pot (i.e. 8 inch pot = 8 ounces of Pour 'n Grow. Avoid applying to plant foliage. A NanoQuantics employee purchased two geraniums at the same time from a major retailer. The plants were discounted because they were too small and looked diseased. 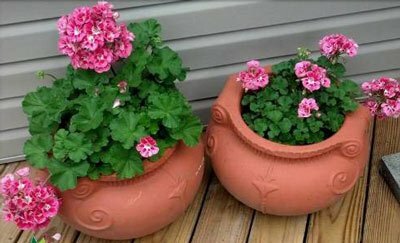 The geraniums were planted in pots. Three days later the plants were delivered to his parents. The employee's father applied SOIL SENTINEL soil amendment to one of the geraniums (left) as the product package directed. The other plant was left untreated (right). Below are the results after two weeks. The plant treated with SOIL SENTINEL is remarkably more healthy. African Violets purchased from a local "Big Box" store were treated once with SOIL SENTINEL, watered weekly, and compared to plants that were untreated and watered on the same schedule. All plants were maintained under a grow light in identical temperature and relative humidity conditions in the laboratory. The plants on SOIL SENTINEL displayed greatly increased plant health, flowering frequency and root mass. The plants on water only faded to near death after six months. Before one of the failing plants died completely it was treated with SOIL SENTINEL. Within three weeks the violet rebounded and produced its first flower in over five months. At a coal site in South Western Virginia, NanoQuantics' field staff evaluated our solution against a water-only hydro-seeding application. SOIL SENTINEL was used as part of the normal seeding process and added to the water used in a typical hydro-seeding which included seed, fertilizer and a newspaper-as a binder. All were applied simultaneously in one application. The section treated with SOIL SENTINEL grew much more quickly and after eight weeks the treated site resulted in much longer and thicker coverage. The clover that was present was much larger, taller and denser than the untreated area. The samples taken from the hydro-seeding test plots further showed the success of SOIL SENTINEL. The roots of the treated sample were very white, showing an extremely healthy root system and root nodules are abundant and visible demonstrating nitrogen fixation. The grass blade height on the treated sample averaged 11 inches as compared to 6.5 inches in the untreated area. The roots of the untreated sample were darker and not as healthy. NanoQuantics worked with the Wise County Industrial Development Authority on the demonstration of hydro-seeding at a former mountaintop removal site that is now part of the Lonesome Pine Business & Technology Park. The contractor hydro-seeded in the fall by mixing SOIL SENTINEL with water and then applied it to a section of this coal-spoilÂ site. The soil had extremely acidic conditions. The results, displayed in the images to the left, shows the SOIL SENTINEL-treated seed resulted in thicker, taller, healthier grass.